You will likely see some of them as you are off to the USBC Championships and side tournaments in a few weeks. If you will be seeing a program sheet for your event, this article and its continuation next month will come in very handy in interpreting all that valuable information. We used to put oil, aka lane conditioner, on the lane with a spray gun. The laneman would walk back and forth, back and forth, spraying oil from the gun. Then he would drag the oil from the foul line to however far down the lane he needed it to go. That laneman would be pretty consistent in his craft but what if he was on vacation or out sick? His substitute did the best they could but their technique was not his technique. Maybe they pressed harder or longer or stopped for a pizza between lanes 16 and 17. Maybe they held the gun higher or walked faster. There was no intent to screw things up for the bowlers. It’s just human differences. In the 1980s automated machines were becoming more popular. Known as wick machines, they “wicked” the oil from a tank. The oil then went on to a transfer roller which touched a buffer brush. That buffer brush was what touched the lane. Temperature had a lot to do with how lane oil behaved. If it was hot, the viscosity of the oil decreased and the oil became “thinner”. If the machine was stored next to an outside wall and it was cold outside, the viscosity of the oil increased and the oil became thicker. Thicker oil was harder to get through the wick, and therefore harder to get onto a roller, and onto the buffer brush. Therefore, less oil was applied even though the laneman did everything the same as yesterday. If the oil was thinner, more oil passed through the process and was applied to the lane even though the laneman did the same thing today that he did yesterday. The shape of the pattern was the same but the volume of oil was not. Wick machines don’t give individual board control. The wick pads were usually in three, five, or seven board widths. So, if you had a five-board width, you either oiled those five boards or you didn’t. There was no fine-tuning. If that five board width was the outside boards, for example, all five got the same amount of oil. You couldn’t taper it so that the 4th and 5th boards got more oil than the 1st, 2nd, and 3rd boards. John Davis of the Kegel Company designed the first machine that worked with a fluid metering pump (like the one they use for IVs in hospitals). It precisely measures the oil in microliters. Although there are other brands of computerized machines, Kegel machines are the only ones that can provide data on exactly how much oil is being applied to the lane. The first combination cleaning/oiling machine appeared in the ‘90s. If you could poke a button, you could do the lanes. Of course, there was a lot more to it than that. The Kegel machine, for example, works kind of like a laser printer. The printer head goes back and forth putting letters on a piece of paper. With the Kegel machine, the oil head goes back and forth depositing a precise amount of oil across a defined area. Each pass is known as a “load” in Kegelese. The machine can travel at different speeds. If the machine goes quickly down the lane, less oil is being applied. If it travels slowly, more oil is being applied. Each manufacturer’s machine can give you a printout of what it has done. Kegel’s is called a program sheet, essentially the report card for the machine. It tells you how much oil has been applied to the lane and where it is located. Some folks think that can give you a heads up about where to play the lane. Sometimes they are right. If you have bowled the USBC Championships, Junior Gold, the Team USA Trials, The BTM and The 123, or any other event in which Kegel has been responsible for the condition, you may have seen the program sheet posted online or at the tournament site. Here’s the translation. Across the top of the page you will see the name of the event. Under that you will find the pattern details. The two boxes on the left side of the page contain the details for the forward and reverse passes. Down the right side of the page is a pretty picture with different colors. Those colors represent the forward, reverse, combined, and buff areas. Under that are the volume ratios and a composite bar graph. We’ll start with the forward pass detail box. A forward pass is what it says it is – the machine moving forward from the foul line toward the pins. The first two columns, Start and Stop, tell you on what board on the left the oiling began and how far across the lane it went. In this example, the oil goes from the 2 board on the left to the 2 board on the right, often called 2 to 2. The 3rd column, Loads, tells you how many times the machine is going to apply conditioner between the start and stop boards. So, in this example, there will be 6 loads applied from the 2 board on the left to the 2 board on the right. In other terms, the oil head will travel between the 2 board on the left and 2 board on the right six times while applying the oil. The 4th column is the Speed of the machine in inches per second. Again, the slower the machine travels, the more loads can be applied to a given area. Since it is generally true that there is more oil in the heads than there is near the end of the pattern, the machine will run more slowly in the heads and pick up a bit of speed as it gets toward the end of the pattern. So, the machine will go slow-to-fast on a forward pass and fast-to-slow on its return journey (known as the reverse pass). The 5th column is the total number of boards Crossed per load. Here’s how that is figured. There are 39 boards on the lane. The machine crosses 37 of them (from the 2 board on the left to the 2 board on the right). So, we are applying 6 loads of oil across 37 boards. That’s 222 boards crossed. You can see in the second row, where we are oiling from 5 on the left to 5 on the right, we use only 1 load. That would be 31 boards crossed. If I add up numbers in the 5th column, the total boards crossed during the forward pass would be 385. You can see that in the program banner just above the forward pass box. On the reverse pass, the machine crossed 119 boards. So, the total number of boards crossed for this pattern is 504. Now let’s talk about the Start, End, and Feet columns. The operator has the ability to program the parameters for the first four columns. He can determine from where to where he wants to put how much oil (loads) and how fast he wants the machine to travel. The next three columns are computed by the machine based on the input from the first four columns. Essentially, the machine is calculating the distance it will take to apply that number of loads at that speed. 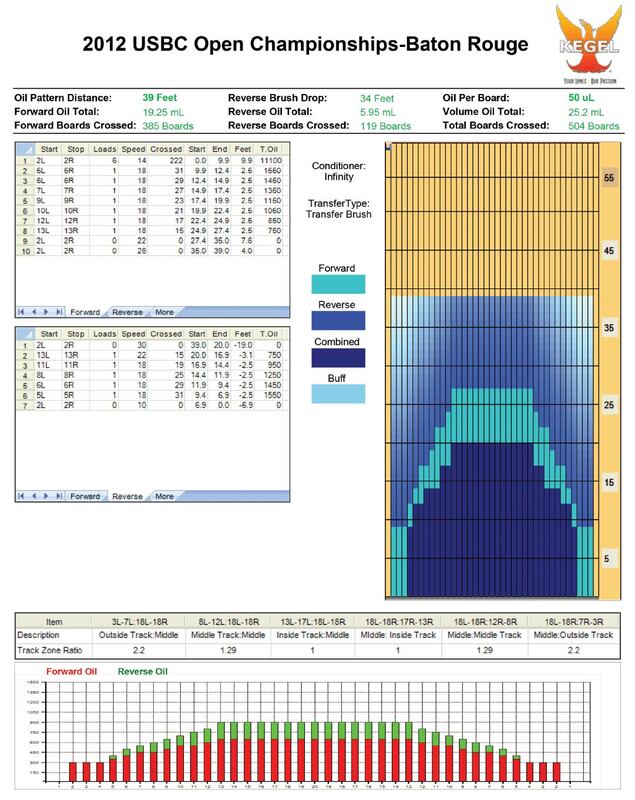 So, in the 2012 USBC Championships lane pattern example, if you program six 2 to 2s at a speed of 14 inches per second, the computer calculates it will take 9.9 feet to apply those six loads. In the second row, you require one load at a speed of 18 inches per second to go from 5 on the left to 5 on the right. The computer says it will take 2.5 feet to complete that task. So, this second row will begin where the other ended at 9.9 feet and travel 2.5 feet, ending at 12.4 feet past your starting point. Now let’s look at the Total Oil column. Oil is calculated in microliters because that is the method the fluid metering device uses. If the pump is set at 50 microliters per board for this pattern (see the pattern design section), just multiply. We know the 2 to 2 load covers 37 boards. One load at 50 microliters per board crossing 37 boards equals 1850 microliters. Since 1000 microliters equals 1 milliliter, that is the same as 1.85 milliliters. In this example, we are crossing 222 total boards with six loads from 2 to 2. That’s 222 times the pump value of 50 microliters per board or 11100 microliters (11.10 milliliters) of oil. Those computations continue for each row. Forward boards crossed total 385 x 50 = 19250 microliters = 19.25 milliliters. Reverse boards are 119 x 50 = 5950 microliters = 5.95 milliliters. 19.25 milliliters from the forward pass plus 5.95 milliliters from the reverse pass = 25.2 milliliters total. A huge thanks to Brandy Padilla, Richard Wiltse, John Janawicz, and the staff at Kegel for the help with this article.